The fifth preliminary day was held at the ASBC Asian Confederation Boxing Championships in Bangkok, Thailand where the goal of the competitors was the same as yesterday to advance to the quarter-finals of the event. The top boxing nations of the continent such as Kazakhstan, Uzbekistan, Thailand, Mongolia, Iran and Japan all did well during the preliminaries but Turkmenistan also joined to them with great performance. Uzbekistanâ€™s Summer Universiade Games winner Hasanboy Dusmatov and Kazakhstanâ€™s defending ASBC Asian Champion Temirtas Zhusupov had to meet in the preliminary round in Bangkok. Both boxers fought successfully in the World Series of Boxing but only one of them could advance to the next round of the tournament. The Kazakh boxer received a warning from the Vietnamese referee after the first tactical round while Dusmatov had clear punches in the third round which decided the bout. The Uzbek boxer eliminated the defending champion and advanced to the quarter-finals of the event. Japanâ€™s 19-year-old Tomoya Tsuboi received the right to fight for his country at the very first time in a big event. He had to meet with Iranâ€™s Houman Taghanihoular who had great youth career and he is trying to raise his international experiences in Bangkok. The 21-year-old Iranian boxer received a warning from the referee very quickly as he should have been follow the heads up strategy. The final round was a spectacular one but as per the previous expectations the Japanese boxer could win their contest. AIBA Teamâ€™s ASBC Asian Confederation Boxing Championships silver medallist Laishram Devendro Singh knocked down very quickly Chinaâ€™s He Junjun who fought at the World Series of Boxing. Singh was confident in the second part of the first round while the Chinese boxer tried to move more. The uppercuts of the Chinese boxer looked dangerous but Singh was able to avoid them and won all of the rounds in their great contest. Indonesiaâ€™ Cornelis Kwangu Langu won the gold medal at the Southeast Asian Games and had to fight against one of his main regional rival Vietnamâ€™s Huynh Ngoc Tan. Kwangu Langu tried to box from closer distance and his infighting style was approved also from the Vietnamese boxer. Kwangu Langu advanced to the quarter-finals in the last edition of the ASBC Asian Confederation Boxing Championships in Amman and now he did it also in the Bangkok event. DPR Koreaâ€™s Ham Jong Hyok involved to the national elite team last year and competed in the Incheon 2014 Asian Games before his 19th birthday. The North Korean boxer was taller than Thailandâ€™s Samak Saehan who competed only in two international tournaments before the start of the ASBC Asian Confederation Boxing Championships. Ham controlled the first round but the Thai athlete had powerful punches in the middle of the bout therefore the North Korean boxer had to go to the medical corner twice. Ham survived the warm moments, worked longer in the last round and his height advantage delivered for him a place in the last eight. Koreaâ€™s AIBA Youth World Boxing Championships competitor Kim Won Ho is only a teenager but he proved top quality of boxing in Bangkok in spite of the fact he relates to the youth age group. His opponent was Incheon 2014 Asian Games quarter-finalist Gankhuyag Ganerdene who had excellent performance in the middle part of the bout. The 18-year-old Korean athlete knocked down his Mongolian rival in the final round but Ganerdene won their narrow battle in Bangkok. Philippinesâ€™ Southeast Asian Games silver medallist Rogen Ladon boxed with Kyrgyzstanâ€™s Rakhmankul Avatov who won two international tournaments in Kazakhstan this year and defeated Incheon 2014 Asian Games bronze medallist Turat Osmonov at home. The Filipino boxer was motivated and confident in the first round while his Central Asian opponent raised his rhythm in the second three minutes. Ladon proved better performance and won their contests by unanimous decision in Bangkok. Kazakhstanâ€™s AIBA World Boxing Championships bronze medallist Kairat Yeraliyev had to meet with Philippinesâ€™ Incheon Asian Games bronze medallist Mario Fernandez who was the Athlete of June in Asia. Both boxers are in the world class level. The first round was a tactical one with low number of effective punches while the Filipino boxerâ€™s left hooks were successful in the second round. Yeraliyev had great footwork in the bout while Fernandez found the best fighting distance too late. The Kazakh boxer proved virtuoso performance and eliminated one of his main rival in Bangkok. Japanâ€™s ASBC Asian Confederation Boxing Championships bronze medallist Kenji Fujita was the favourite against Mongoliaâ€™s veteran Iderkhuu Enkjargal who is member of the national squad since 2006. Fujita received two warnings from the referee which was serious for the young Japanese in the middle part of the bout. The Japanese boxer stepped into the gas and he knocked down his Mongolian rival in the third round but his efforts were not enough to turn back the contest. Thailandâ€™s AIBA World Boxing Championships bronze medallist Chatchai Butdee moved up to the Bantamweight class (56 kg) just before the start of the ASBC Asian Confederation Boxing Championships. The 30-year-old Thai boxer had to meet with Iraqâ€™s Jaafar Al-Sudani who began the championships with strong performance but this time he was not in the same level as his local opponent. Butdee was too quick and smart for the Iraqi boxer and advanced to the Top 8 in Bangkok. 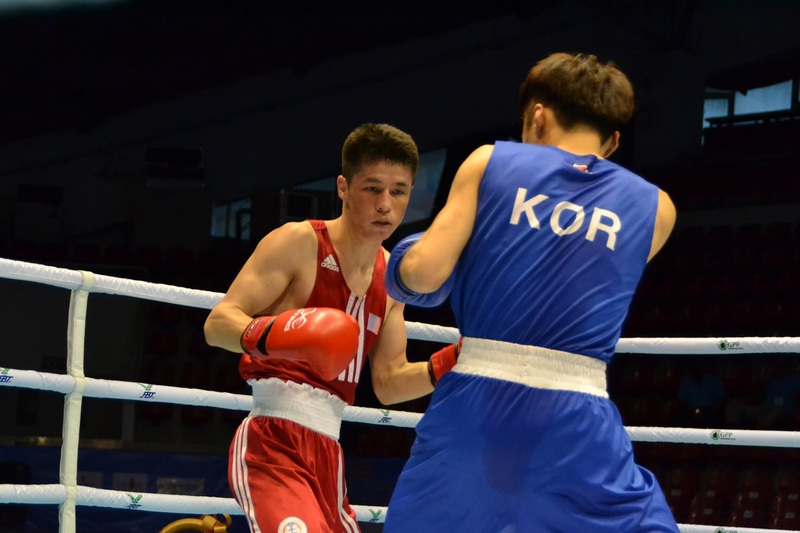 Turkmenistanâ€™s ASBC Asian Confederation Youth Continental Championships bronze medallist Yakub Meredov won his opening bout and continued his competition against Bhutanâ€™s Nima Dorzi who is a newcomer in the international level. The 22-year-old Central Asian boxer had serious punches in the second round and he did also great performance in the final frame as well. Bhutanâ€™s new boxer suffered a loss but his fighting spirit was excellent in the bout which was his first international one. Kyrgyzstanâ€™s ASBC Asian Confederation Boxing Championships bronze medallist Omurbek Malabekov dominated his contest over Nepalâ€™s Dinesh Shreshta who tried to attack but his opponent footwork was better in the bout. Malabekov knocked down Shrestha in the opening round and finally the Nepali boxer injured which delivered a victory for Kyrgyzstan in the fifth competition day. AIBA Teamâ€™s Shiva Thapa arrived to the venue of the ASBC Asian Confederation Boxing Championships as a titleholder but he had to box firstly against not an ideal opponent, Jordanâ€™s Mohammad Al-Wadi who achieved several great results in the recent years. Jordanâ€™s veteran boxer had clear punches in the second round while Shiva Thapa had some great attacks in the final three minutes therefore the judges had hard to mark the winner of the contest. The Indian boxer won their contest by unanimous decision but Al-Wadi also proved he is among the bests in the Bantamweight class (56 kg). Pakistan’s Nadir Baloch shocked Vietnamâ€™s National Champion Tran Phu Cuong in the opening round when he had several clear shots and demonstrated his fighting spirit. The Vietnamese boxer felt he needs to show more from his knowledge in the second round and knocked down Nadir therefore the final result depended on their performance in the last three minutes. Tran was able to knock down his South Asian rival once again and advanced to the quarter-finals which is his career highlight. One of the best bout at the Bantamweight class (56 kg) was held between Uzbekistanâ€™s AIBA Youth World Boxing Championships silver medallist Murodjon Akhmadaliyev and Koreaâ€™s Incheon 2014 Asian Games winner Ham Sang Myeong. The Uzbek boxer has done an incredible opening round with high number of attacks and he could also continue almost the same level in the second frame. Akhmadaliyev was a bit tired after the great runs in the final round but his advantage was enough to get the triumph in Bangkok. Kazakhstanâ€™s Daniyar Yeleussinov is the current AIBA World Champion, ASBC Asian Champion and the Asian Games winner. He won the Best AIBA Boxer Trophy in 2013 and also in 2014 as well which means he is the top favourite in Bangkok at the Welterweight class (69 kg). His first rival, Sri Lankaâ€™s Sisira Ruwangala Gedara Kumarasinghe was enough brave in their contest but Yeleussinov knocked him down three-times and the referee stopped their bout before the final gong. Jordanâ€™s ASBC Asian Confederation Boxing Championships bronze medallist Mohammad Al-Assi had not so good enough year in 2014 but now he returned to the competitions in better form. The 23-year-old Jordanian boxer had to meet with Chinaâ€™s experienced athlete Liu Wei who fought at the World Series of Boxing. The Chinese boxer had a great attacking run in the first round and he had several successful combinations in the middle part of the contest as well. The referee counted Al-Assi who could do his best only in the final round which was not enough against the motivated Chinese boxer. Iranâ€™s London 2012 Olympian Amin Ghasemipour is an experienced boxer while his first opponent in Bangkok Qatarâ€™s team captain Hzam Nabah is already 34. The Syrian-descent Qatari boxer moved forward from the first seconds but his Iranian rival was more successful in the counter-attacks. The referee counted Nabah after Ghasemipourâ€™s serious punch in the second round and the Iranian boxer moved ahead to the quarter-finals in Bangkok. Mongoliaâ€™s AIBA Asian Olympic Qualifiers silver medallist Byamba Tuvshinbat tried to control his bout from the first seconds against Pakistanâ€™s two-time National Champion younger hope Tanveer Ahmad. The 28-year-old London 2012 Olympian knocked down his opponent in the first round who was a competitive rival but finally Tuvshinbatâ’s hand was raised after the final bell. AIBA Teamâ€™s ASBC Asian Confederation Boxing Championships silver medallist Mandeep Jangra had to reduce the fighting distance against Japanâ€™s London 2012 Olympian Yasuhiro Suzuki who is the tallest boxer in Asia at the Welterweight class (69 kg). Jangra played in the second round and his strong defense was the base to the successful attacks. The Indian boxer received a warning from the referee and suffered a loss to the Japanese hope who will now meet with Turkmenistanâ€™s Timur Tajimov. Thailandâ€™s two-time Olympian Saylom Ardee moved up two weight classes before the start of the ASBC Asian Confederation Boxing Championships. He fought with Koreaâ€™s Lee Seung Hyeon in his opening bout on Day 5 and supported well enough by the local boxing fans. Ardee had still enough good footwork to beat technician boxers as well which delivered for Thailand another place in the quarter-finals. Uzbekistanâ€™s Israil Madrimov was silver medallist in the Incheon 2014 Asian Games and seeded as No.2 in Bangkok. The 20-year-old Uzbek boxer had to meet another promising young hope Philippinesâ€™ AIBA Junior World Champion Eumir Felix Marcial which contest was an anticipated one. The Uzbek boxer was not enough shape in the opening minute while Marcial had more punches in the later actions and defeated his strong rival. Kazakhstanâ€™s current AIBA World Champion and Incheon 2014 Asian Games winner Zhanibek Alimkhanuly started his road to the final bouts against Chinaâ€™s Zhou Di who eliminated Incheon 2014 Asian Games silver medallist Odai Riad Al-Hindawi in the first preliminary round. Alimkhanuly had the height advantage but he tried to control the contest from the first seconds and after the first tactical round he raised his rhythm and demonstrated he is one of the best boxer in the whole Kazakh squad. 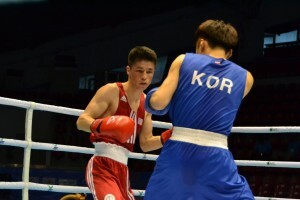 Uzbekistanâ€™s Nanjing 2014 Youth Olympic Games winner and AIBA Youth World Champion Bektemir Melikuziev spent only two and half minutes in the ring against Sri Lankaâ€™s Nawarathne Senanga who was not enough strong to survive the opening round. Melikuziev knocked down his Sri Lankan rival three-times and after his lethal body punches the referee stopped their bout in Bangkok. Iranâ€™s ASBC Asian Confederation Boxing Championships bronze medallist Sajad Mehrabi is also a strong fighter at the Middleweight class (75 kg) who arrived to the event after his gold medal at the Fajr Tournament. Mehrabi was able to knock down Koreaâ€™s Lee Dong Yun in the opening round but he had some problems later on. The Iranian boxer re-newed in the final round and his excellent jabs demonstrated he is the better competitor. Thailandâ€™s China Open Tournament bronze medallist Aphisit Kanankhokkruea and Kyrgyzstanâ€™s National Champion Azamat Kanybek Uulu did great run in the final bout of the afternoon session. Both boxers wanted to fight and moved ahead until the final bell. There were several clear punches on both sides and in spite of the fact the Kyrgyz boxer also did great efforts, the host nationâ€™s hope advanced to the next round of the ASBC Asian Confederation Boxing Championships. Iraqâ€™s ASBC Asian Confederation Boxing Championships bronze medallist Waheed Abderredha and Mongoliaâ€™s Narmandakh Shinebayar did a real spectacular battle in the preliminary round of the category. The two veterans had great fighting spirit and both of them were bleeding in the final round. Abderredha had more punches in the final round and that was the difference between them in Bangkok. The Iraqi boxer will now meet with Lebanonâ€™s National Champion Nadim Salloum who eliminated Chinese Taipeiâ€™s Yeh Chin An. AIBA Teamâ€™s Vikas Krishan Yadav was gold medallist at the Guangzhou 2010 Asian Games and claimed several further medals during his career in the AIBA and ASBC events. He was a bit slow in the opening round against Turkmenistanâ€™s Arslanbek Achilov who was a really tough opponent. The Indian boxer improved his footwork and dominated the second round while Achilov was really offensive in the final three minutes. Their contest was a tight one but finally Vikas Krishan Yadav was able to advance to the next round in Bangkok. The continental competition will be continued with its sixth preliminary day tomorrow when 24 bouts will be held in Bangkok.